At the premiere of the 17th BMW Art Car Jeff Koons unveiled and signed his car in front of 300 international VIP guests on 1st June in the Centre Pompidou, one of the world’s most prestigious cultural institutions for modern and contemporary art. It is the same venue where Roy Lichtenstein, back in 1977, first presented and signed his Art Car. In the spirit of Calder, Stella, Lichtenstein, Warhol, BMW announced this year that the 17th Art Car created by Jeff Koons will race where the first rolling pieces of art by legendary artists raced – at the 24 Hours of Le Mans in France on 12th and 13th June 2010. 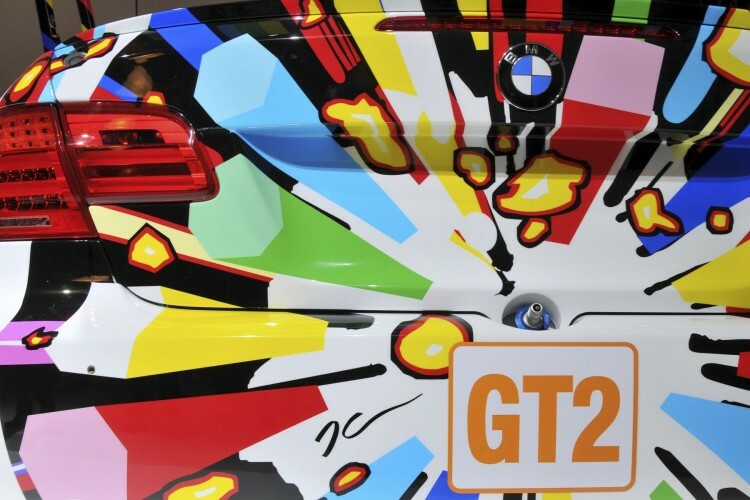 Koons’ canvas is a BMW M3 GT2, which was homologated to compete at this year’s running of the world’s most famous endurance race. On 2nd June, between 11 am and 9 pm, the public will have the chance to see the Art Car free of charge in the Forum of the Centre Pompidou. At 5.30 pm Jeff Koons will participate in a book signing at the museum’s official book shop before he talks about his work in conversation with Alain Seban, President of the Centre Pompidou, at 6 pm at the Forum of the museum. As part of his creative process, the artist collected images of race cars, related graphics, vibrant colours, speed and explosions. The resulting artwork of bright colours conceived by Koons is evocative of power, motion and bursting energy. With its silver interior as well as the powerful exterior design, the Art Car will impart a dynamic appearance even when it’s standing still. Koons has been in an intense collaboration with BMW’s team in Munich for months – melding his skill with sophisticated BMW engineering – to ensure the 17th BMW Art Car will be race-ready for the 24 Hours of Le Mans. Travelling back and forth to Germany many times since the 2nd February announcement that Koons would create the 17th BMW Art Car, the artist has worked with the BMW engineering and design teams to conduct in-depth explorations of materials and application options that will prove crucial to optimizing both the aesthetic and aerodynamic attributes of the race car. Working with actual 3-D computer-aided design (CAD) models of the BMW M3 GT2, Koons was able to simulate the application of the graphic to the car’s surfaces and evaluate it from all angles. Koons even donned a helmet and joined BMW’s American Le Mans Series race team for testing in Sebring, Florida, on 23rd February. Koons was able to experience the M3 GT2 at race speed to further inspire his design. As Koons describes it, he witnessed “the raw unfiltered performance” of the M3 GT2 from the seat of a historic BMW M1 race car. Koons also drove a BMW M3 Coupe on the circuit to further the dynamic exercise. 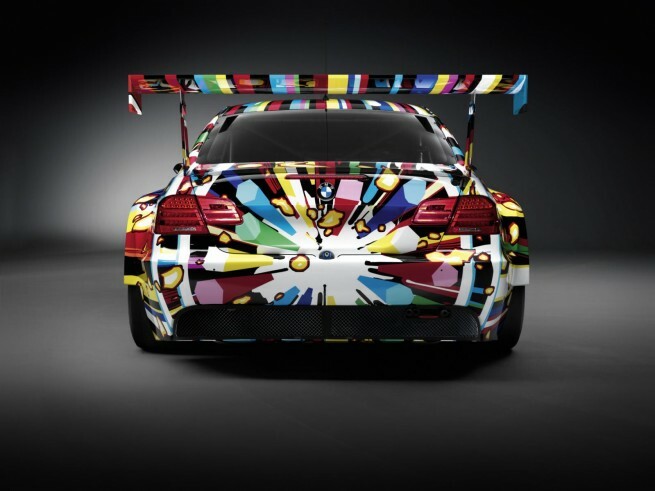 Under Koons’ direct guidance and supervision, his BMW Art Car was produced in association with a team of BMW engineers and designers at Schmid Design, near Munich. 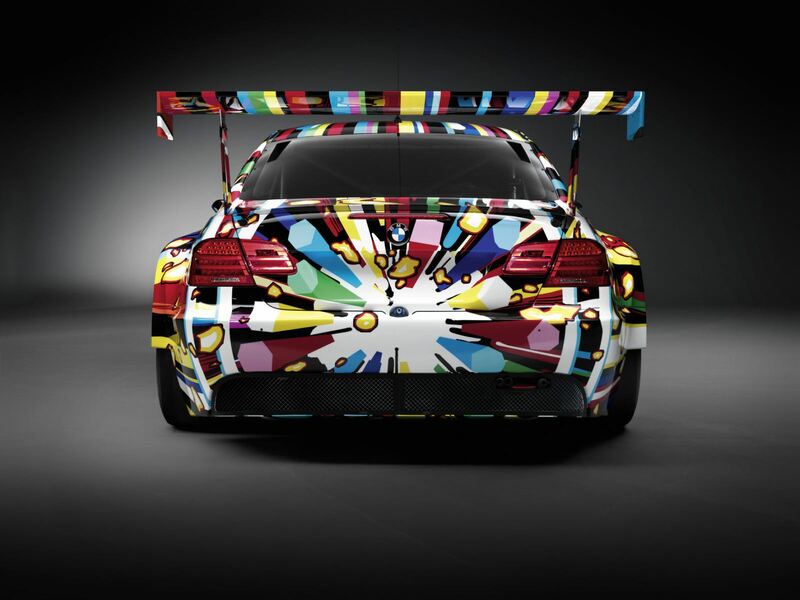 The challenge to create the BMW Art Car had to do with using a light material and a design that would not interfere with the race car’s aerodynamics and weight. Timing was also an issue, as there was only a two month window between the first design sketches and the Paris world premiere. This is why digital print on car wrapping vinyl was used covered by a double clear-coating to bring out the colour. To apply hundreds of dynamic lines of Koons’ design onto the car, CAD designs were translated from 3D into 2D for the printing process and then painstakingly applied to the entire car as well as onto individual spare parts. Koons design incorporates many bright contrasting colours to communicate the aesthetics of power. The concept design was transformed into hard edged lines of colour. Graphics of debris were added to the rear sides and back of the car to simulate the power of the car. Furthermore, two graphic rings on the rear of the car represent supersonic acceleration. 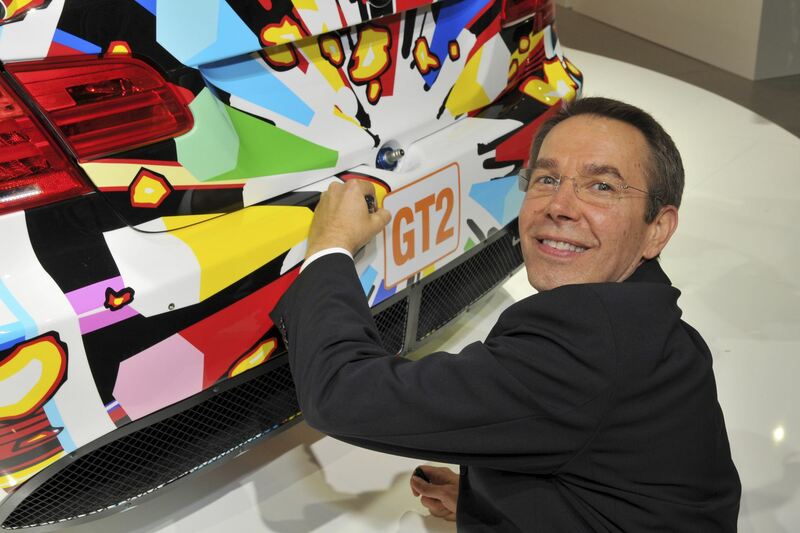 The germination of Koons’ collaboration with BMW began in 2003, when he expressed his desire to create a BMW Art Car. His relationship with BMW started more than two decades ago when he drove a BMW while residing in Munich, home to the BMW Group headquarters. Koons is known for his heartfelt appreciation of cars. Earlier this year he was even recognised by music icon Bono of U2 as one of the ideal artists to design a car that would make the world fall in love with automobiles again. The 24 Hours of Le Mans. In April 2010, BMW Motorsport Director Mario Theissen announced the driver line-up for the 24 Hours of Le Mans. Andy Priaulx (GB), Dirk Müller (DE) and Dirk Werner (DE) will race the no. 79 BMW Art Car. Jörg Müller (DE), Augusto Farfus (BR), Uwe Alzen (DE) will drive the no. 78 BMW M3 GT2. Derived from the BMW M3 high-performance sports car, the BMW M3 GT2 boasts a 4.0-litre V8 engine with a maximum output of 500 bhp, an upgraded chassis, racing-caliber brakes, and extensive use of lightweight materials. Able to reach 100 km/h in 3.4 seconds, the BMW M3 GT2 is rapidly emerging as a real first year contender at this year’s event. For the comeback at Le Mans BMW Motorsport is supported by numerous successful partners. This is why the BMW M3 GT2 will be decorated with the logos of Castrol, Crowne Plaza, Dunlop, Randstad, Sympatex, LuK, H&R, BBS and NGK for the race on the “Circuit de la Sarthe”. Since 1975, artists from throughout the world have turned BMW automobiles into art signifying a particular period through the Art Car programme. In 2007, the latest instalment was revealed with Olafur Eliasson’s “Your mobile expectations: BMW H2R project.” Many of the cars by the likes of Warhol, Lichtenstein, Stella, Rauschenberg, Hockney and Holzer have been exhibited in renowned museums throughout the world including the Louvre, the Guggenheim Museums, and the Shanghai Art Museum. They have been displayed at the BMW Museum in Munich, between 2006 and 2010 and many went on a world tour throughout Asia, Russia, Africa, India, the United States and Mexico. The Koons car number, “79”, pays tribute to the 1979 Andy Warhol car. 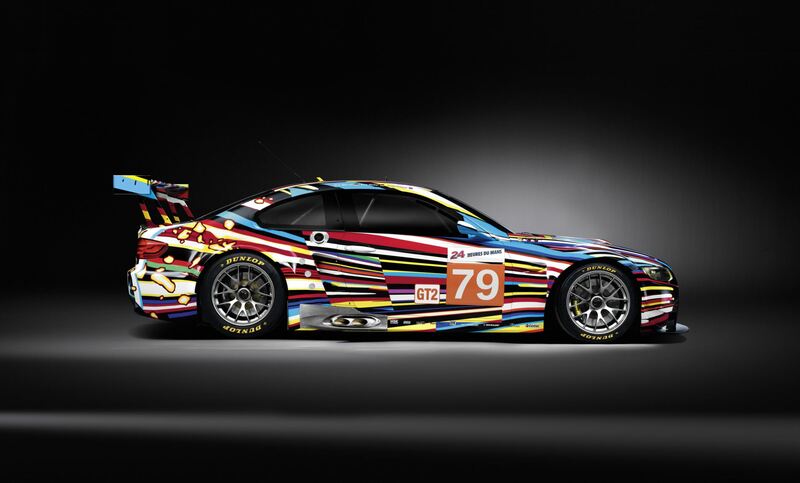 The Warhol car was assigned the number “76,” an homage to the 1976 Frank Stella car, both of which raced at Le Mans. The home of all BMW Art Cars is the BMW Museum in Munich. 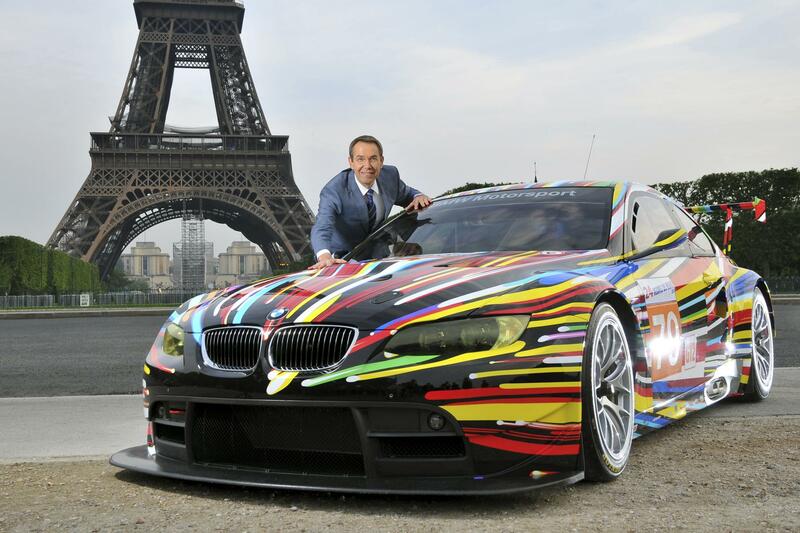 Starting in September, Koons’ 17th BMW Art Car will be presented there together with some of its predecessors. With over 100 major projects worldwide, BMW Group cultural programmes have been an integral part of the company’s contributions to society for almost 40 years. Besides contemporary art, architecture and design, classical music and jazz are key components of this engagement.